Also called frisbee golf, disc golf is a flying disc game, as well as a precision and accuracy sport, in which individual players throw a flying disc at a target. According to the Professional Disc Golf association, "The object of the game is to traverse a course from beginning to end in the fewest number of throws of the disc." What makes our disc golf course unique is the utilization of natural elements such as trees, shrubs and canyons as obstacles as well as elevation changes to make the course challenging. Keeping the raw and environmentally conscious elements add additional challenges to the course. Because of the topography and its importance to the course, there are unseen hazards including wild life, uneven footing, and canyon drop offs. All players should always keep in mind that disc golf discs can be potentially very dangerous if not thrown with safety and common sense always in mind. Never throw a disc in the area someone occupies unless they are completely aware you are throwing it in their direction. Players should always wait until the player or group in front of them have completed a hole and moved out of the way until they throw. If you come upon a hole where the target is blind and you can potentially not see a group ahead it is common procedure to call out "Clear on (#of hole you are on)". If there is no answer you should again call out and before throwing say "Coming down on (#of hole you are on)." Discs can be thrown fast and when hit can cause serious injury. The first permanent, public, disc golf course in Los Alamos County located right next to the rugged Bayo Canyon. Many technical and short holes. Directions: Take the 502 W. exit towards Los Alamos. Coming into Los Alamos, stay on the Main St. which will turn into Canyon Drive. At the Diamond Dr. light, take a right and stay on this street until the roundabout near the golf course. Once you hit the roundabout, follow it up the hill on North Mesa Dr. You will see the course and picnic grounds on the left. From Hwy 4, turn on Sherwood Blvd, and park across the street from Smith's Grocery Store, between library and skate park. 1st tee is west of parking just north of the skate park. 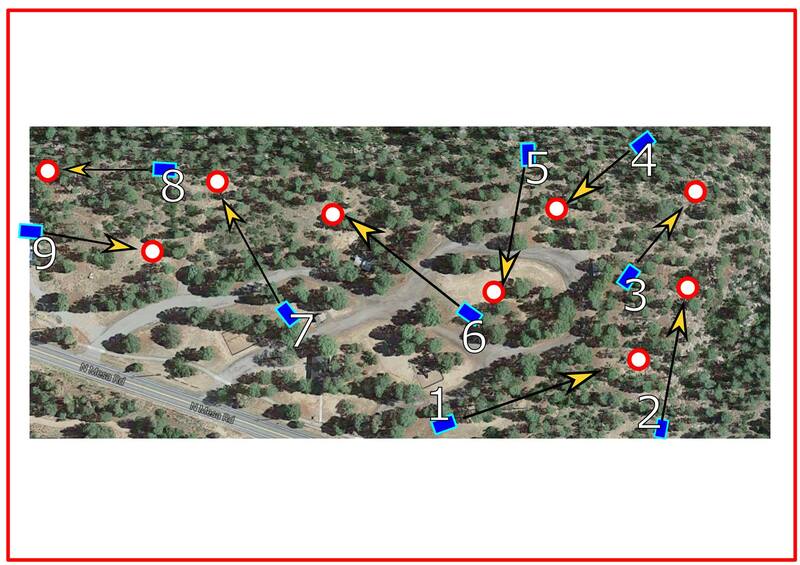 The White Rock Disc Golf Course is located in Pinon Park across from Smiths’ in White Rock. We have 9 holes complete with concrete tee pads. Hole #1 starts at the N side of skate park and winds around the natural Pinon / Juniper landscape with 3 holes up on a mesa overlooking the Pinon Park. The course finishes up at Hole #9 just south of the picnic pavilion near the bridge. The Parks Division is working on signage and when complete will hold a Grand Opening and Tournament later this spring. Directions: From Hwy 4, turn on Sherwood Blvd, and park across the street from Smith's Grocery Store, between library and skate park. 1st tee is west of parking just north of the skate park.